Yamaha's Valentino Rossi says he was "lucky" to finish Sunday's MotoGP race at Jerez as a vibration forced him to slow down "three seconds per lap" towards the finish. Championship leader Rossi started the Spanish Grand Prix from seventh but struggled in particular towards the end of the race and fell to 10th - which included being overtaken by Pramac's Danilo Petrucci, Tech3 Yamaha rider Jonas Folger and the Aprilia of Aleix Espargaro late on. The Italian, who won at Jerez 12 months earlier, said while speed on acceleration had been an issue all weekend he had been forced to slow in order to finish the race after developing a vibration. "[It was a] very difficult weekend and a very difficult race for us," said Rossi. 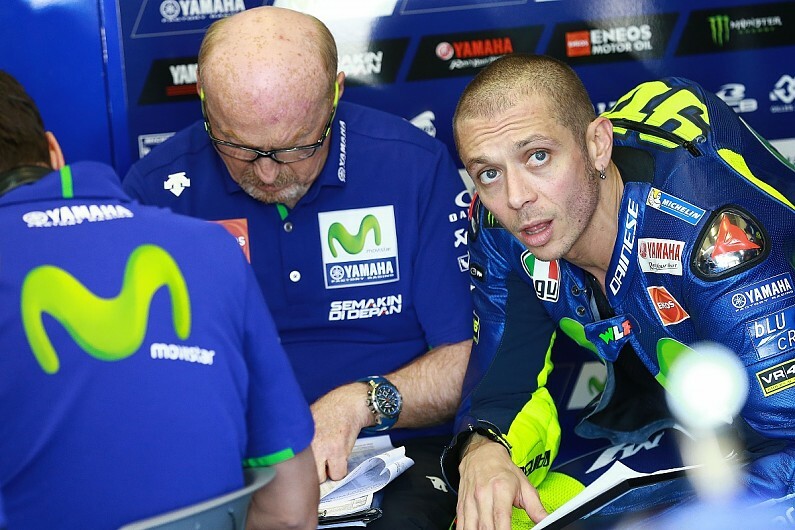 "We expected to be stronger, more competitive, especially looking at the results of previous years at Jerez. Rossi added he had struggled with front-end grip during the race, a complaint also voiced by team-mate Maverick Vinales, and that an attempt to solve the problem in warm-up had not worked. "For the race we tried to modify the balance because we were worried for the life of the medium rear [tyre], because for us the hard was impossible to use. "So we try to spin [the tyres] less but at the end it was worse because I lost feeling in the front and then the race was very difficult for braking and entry. "I cannot speak about problem of degradation because I never had grip. "I never had a good feeling with the bike during the weekend. "Usually this is a track where you spin quite a lot, especially in the last years. But this time we suffered more. "Now it's easy to say that we did a mistake. We risk, but we have to try, because in the warm-up I was 10th. "I thought with that setting I can do a bit better, but we have to try to make a good race, not just better. "Unfortunately this time it doesn't work but this weekend our bike fought a lot with the tyres, we never find the good grip."